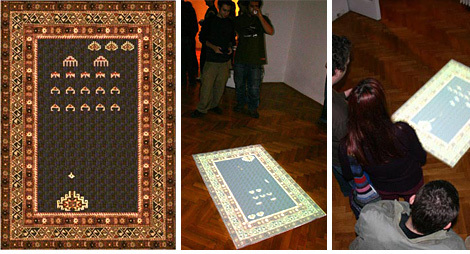 Space Invaders On Your Rug | OhGizmo! From its beginnings this classic game dealt with political problems. The initial human figures where swiftly transformed into pixilated, triangular shaped, medusa-like, skull-headed extraterrestrials, so as to hide the body counts and bloody scores. Bible-belt communities felt terribly insecure after the tender minds of their sons and daughters got hooked on the game, thus loosing their appetite for Sunday school faith games. While coins got inserted, economical effects where to follow, Japan was suffering a countrywide coin shortage and kids in the States where busting the cash machines for small change. Cultural upsurge was to follow. Yep, that’s exactly what was going through the back of my mind when I used to play Space Invaders. I’m glad I wasn’t the only one. Polske konstn?ren Janek Simons senaste installation ?r en Space Invader-matta. Ett PS2 och en projektor anv?nds f?r att projicera spelet p? sj?lva mattan. i love this show !!!!!!!!!!!!!!!!!!! Oriental rugs can be purchased in most parts of the world today although China, Iran, Afghanistan, India and Turkey remain the most famous rug weaving nations. These rugs have adorned home for decades and have the ability to make rooms look wonderful almost instantly. Apart from that these rugs are a practical option to cover old floors and since they are easy to take care of they last for a lifetime.